NRI US Customs Brokers & Freight Forwarders | Puerto Rico's #1 Customs Brokerage & Freight Forwarding Firm! We are OPEN, and WE ARE HERE TO HELP REBUILD PUERTO RICO. We have a wide range of services available for all type of customers. Whatever your shipping needs, Nestor Reyes Inc. is here to serve you and make sure your shipment is safe, from Pick-Up to Delivery, just like you deserve. For more than 40 years, NRI has been providing its customers with top Quality Service coupled with the latest Technological Innovations for today's Global Success. 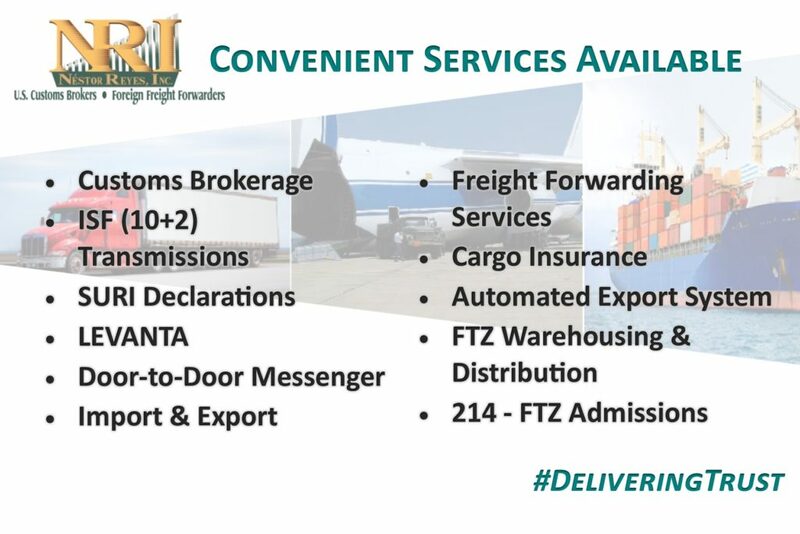 NRI invites you to learn of all the services and benefits it has to offer you and your business, from Customs Brokerage & Foreign Freight Forwarding to Foreign Trade Zone program and On-Line Tracking of your shipment. Customers access to our online tracking sytem.